For Canadians who love pets, The Pet Network is the only television destination entirely dedicated to delivering entertaining and informative stories about the beloved animal companions who share our lives. Please visit www.thepetnetwork.tv and let them know how much their support of HelpingLostPets.com means to pet lovers everywhere. Over 30 Lost / Found Recovery Organizations have joined us and are using our website. These volunteers are truly amazing and an integral part of getting lost pets back home. We are pleased to provide our website and services free to these organizations as they assist families in their area to find their pets. Lost Dogs of Wisconsin, Lost Dogs of Texas and Ottawa and Valley Lost Pet Network are three of these groups. We urge you to find an organization near you. Join them and help more pets to get home near you. Over 65 Animal Services, Shelters and Humane Societies have joined HeLP. We have many shelters that use our website to list their found strays. This makes it easier for the public to search multiple shelters for their missing pet on one website. Saving people time searching online, means they can spend more time physically searching for their pet. Many of these organizations have our link on their website so the public can post Lost Pets for FREE. Have you set your location so you can receive alerts for pets near you? How many pets go missing within 2 miles of you? Thankfully, it's not many and so you won't be inundated with emails for pets outside your area. You choose how big or small to make your alert area. It's just one of the many features of our website that make it so effective. And don't forget, please add your Safe pets to our website now. We hope you never need us, but if you do, you won't waste valuable time in adding your missing pet. 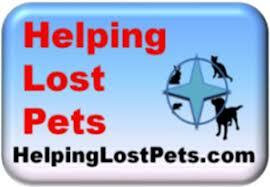 We have recently made it mandatory for all lost / found pet listings to now include your phone number to contact you. Your phone number is not made public. We also urge you to authorize any animal control, shelter or veterinarian to contact you if they believe they have found your pet. You do this when you list your pet by clicking on a checkbox after you have entered your phone number. Our members have thousands of pets also listed as Safe on our website. We also recommend you micro-chip your pet and license your pet with your local municipality. We all want your pet back home if they go missing.